Sleep on the crisp, comfort of the pillows that were previously featured in many Sheraton ® Hotels! 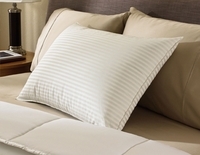 Are you looking for pillows that have been previously featured in many Sheraton ® hotels? Chances are, those pillows are the Pillow Factory ® Comforel ® pillows. These pillows have a crisp, 100% cotton covering, and are filled with Pillow Factory’s ® patented Comforel ® polyester clusters. If you are a side or back sleeper, then these medium support pillows are for you.